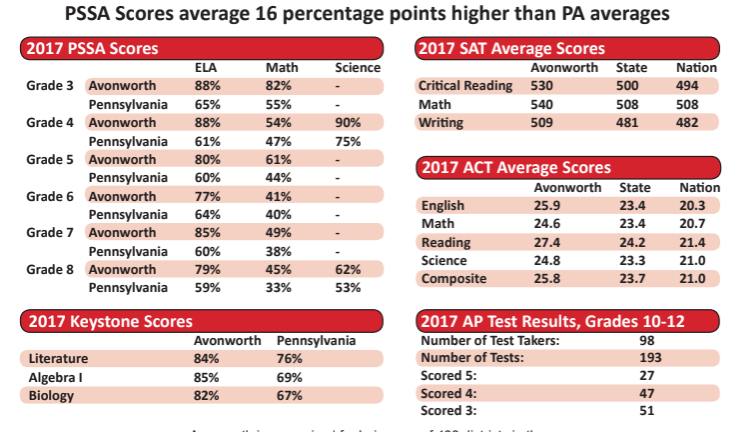 Across the board, Avonworth students score much higher on standardized tests than students from across the state. 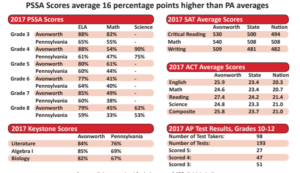 The average scores for Avonworth students are higher than the state’s average as seen in the chart above. Curious as to why this might be, we spoke to Avonworth seniors about how Avonworth prepared them for the test. At Avonworth, students have the opportunity to attend a SAT class after school taught by Mr. Johncour. The class would meet for two hours twice a week. During the class, Mr. and Mrs. Johncour would have lessons on what was in the test, how to prepare for it, and different testing techniques. Many found this class very beneficial. Senior and SAT taker, Chloe Boothby took Mr. Johncour’s SAT class. By taking this class, her score went up substantially. “I got an 1190 on the practice SAT and a 1380 when I actually took the test in March,” said Chloe.